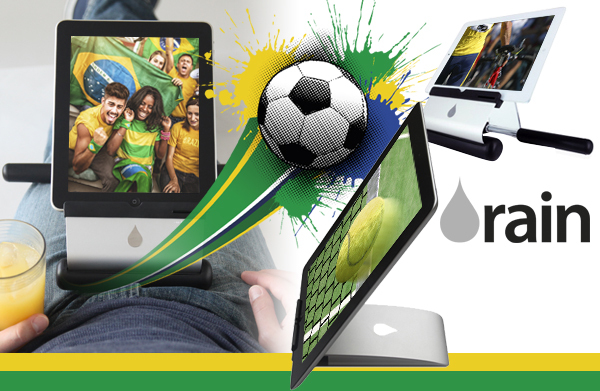 To celebrate the World Cup kick off on Thursday, Color Confidence are offering football fans 10% off the Rain Design iRest lap stand and the iSlider iPad stand, which are great for using on your lap or desktop. Regardless of what football team you support, the award winning Rain Design range will offer maximum comfort, added safety and impeccable style when using an Apple Mac, laptop or desktop computer. The iRest is incredibly versatile and offers removable back cushions and folds flat for easy storage and transportation. It improves the ergonomic use of your iPad / iPad Mini and prevents the hand fatigue that can develop from extended holding usage. It also raises the iPad / iPad Mini, which eases the strain on your neck. The iSlider is a unique iPad rest, which is easy to carry and use. It has a simple slide out base that you can adjust to your preferred viewing or typing angle before placing your iPad on. It fits all iPad’s in both portrait and landscape modes, as well as the iPad Mini. The aluminium casing provides both support and protection with a sleek design in-keeping with the Apple style. The iSlider also comes with a FREE carry bag for easy storage. The Rain Design range, distributed by Color Confidence, also includes the mRest Wrist & Mouse Pad, iLap and mStand laptop stands; all available in a choice of sizes and colours. They can also help extend the life of your machine and is designed to compliment the synonymous style of your Mac equipment. The 2014 World Cup consists of 64 football matches and runs from 12 June – 13 July. The discounted World Cup offer will run until 13 July 2014 or while stock last. This entry was posted in Uncategorized on June 9, 2014 by Color Confidence.